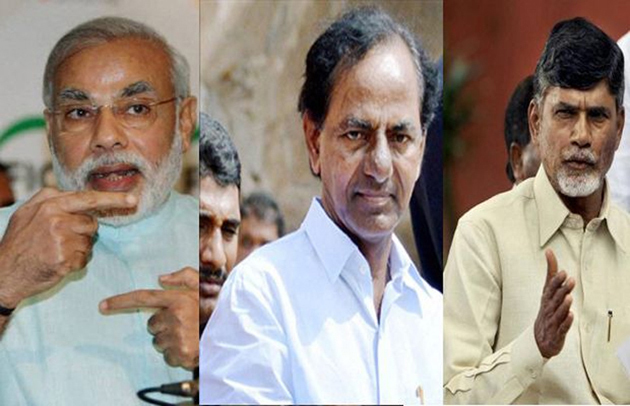 Modi 100 Crore, KCR 25 Crore & CBN 5 Crore! Floods killed close to 200 people in Kerala. The devastation is so bad that as many as 13 districts still remained on red alert. Central and State Governments have been offering financial assistance to Kerala which is in dire state. What's being done by the Telangana CM helped him overshadow even Narendra Modi in this aspect. While the Prime Minister announced just Rs 100 crore for Kerala Flood Relief, KCR declared Telangana is prepared to offer Rs 25 crore. AP CM Chandrababu Naidu informed Rs 5 crore would be contributed to flood victims in Kerala. In a way, The financial assistance offered by KCR has shamed the Union Government. Centre has been receiving 57 percent share in the form of various taxes collected in the states. Discrimination is being shown by the Centre when it comes to offering a helping hand to the states where BJP doesn't hold power. After Hudhud Cyclone, PM announced Rs 1,000 crore for relief and rehabilitation. Only Rs 450 crore out of it was sanctioned so far. How much of Rs 100 crore announced by Modi reaches Kerala? Vajpayee Cremation: Who Is Niharika? Viral: Amit Shah's Pose At Vajpayee Funeral!